Odd Sundays will take place once again at Corked Wine Bar, 83 Regent St. at 2 PM on Sunday, November 5. 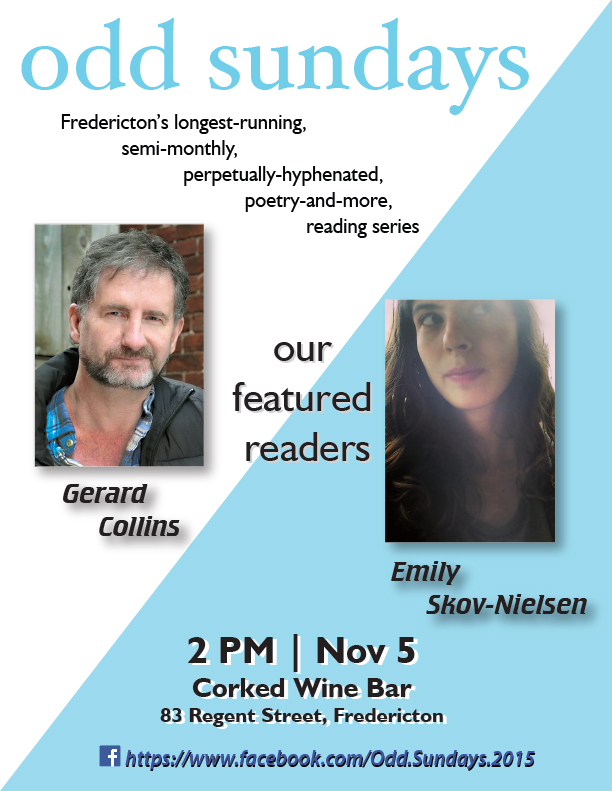 Our guest readers this Sunday will be Gerard Collins and Emily Skov-Nielsen. The readings will be followed by an open mic and a book draw. Gerard Collins is an award-winning Newfoundland author now living in southern New Brunswick. His novel Finton Moon was nominated for the Dublin IMPAC prize and the Sunburst Award, among others, and won the Percy Janes First Novel Award, while his debut short story collection, Moonlight Sketches, won the 2012 NL Book Award. After a much-needed fallow time, he’s now working on two new novels, a memoir, and a short story collection, which leaves just enough time for mentorships and hosting a writing retreat in St. Andrews this fall and Italy next spring, while teaching by distance at Memorial University. Emily Skov-Nielsen is an MA in English and Creative Writing graduate from UNB. Her poems have appeared in numerous literary magazines across Canada such as The Malahat Review, The Puritan, Prairie Fire, and The Fiddlehead, among others. In 2014 she was shortlisted for The Malahat Review's Far Horizon's Award for Poetry and in 2017 two of her poems were nominated for The Nick Blatchford Occasional Verse Contest. She has recently published a chapbook with Anstruther Press titled Volta. Emily currently lives and writes in Fredericton, NB.